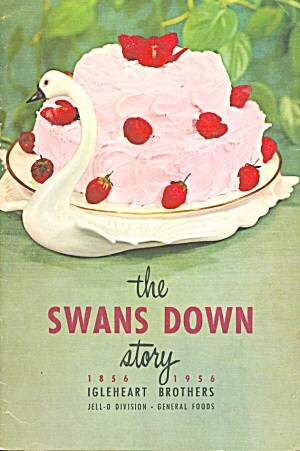 One of my favorite vintage cookbooks to collect, are the Swans Down Flour cookbooks. I have a handful of them in my cabinet. 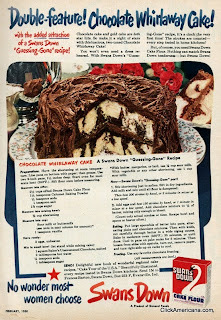 And they are filled with great vintage recipes. 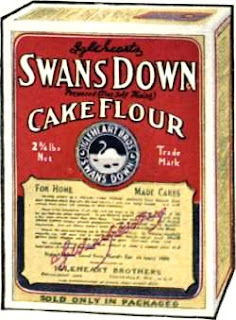 Now Swans Down has been making cake flour since 1894. And through the years... they gave out aluminum measuring cups in bags of flour. Which of course I have one that I use! 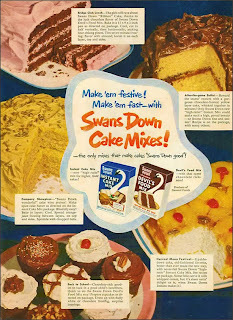 Swans Down did make cake mixes. But I have not ever seen any of them for sale. But I do purchase their normal cake flour here locally. 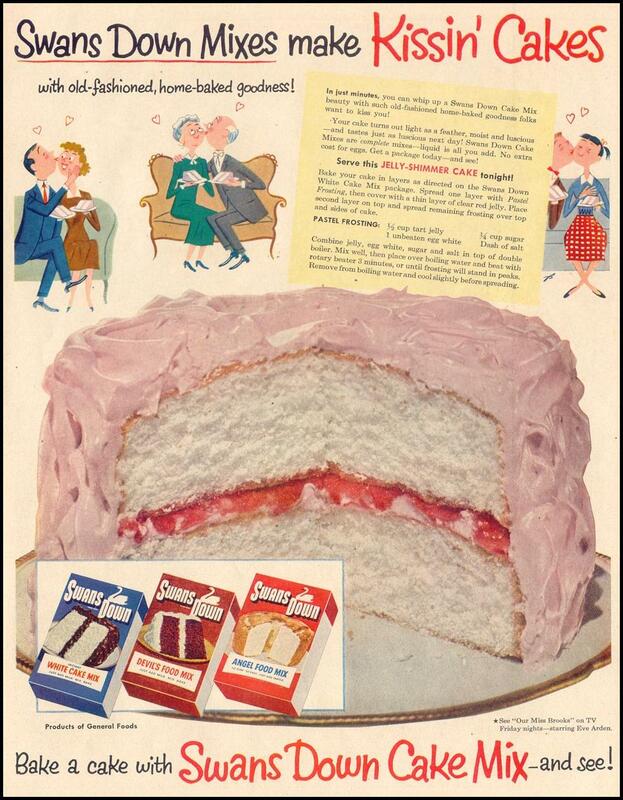 Now lets take a peek a few of their vintage advertisements. I wish flour makers would go back to having these type of advertisements, for their product. 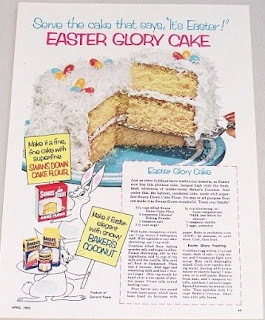 Great colorful images... with a recipe included! Lets leave with one more recipe! 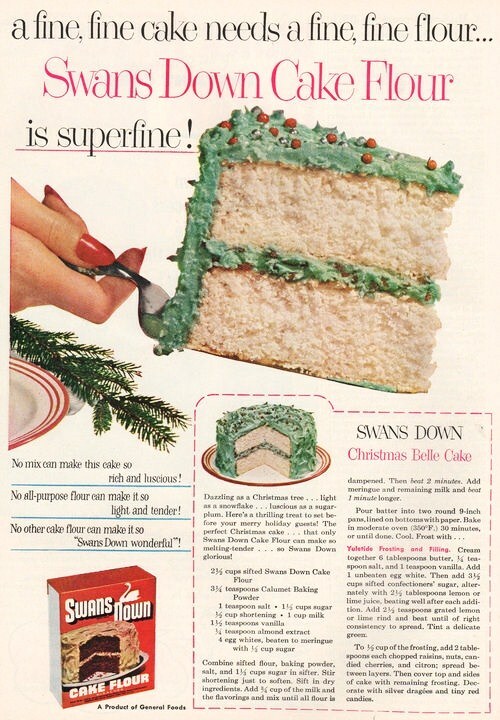 Dang it... now I want some cake! My mom gave me a Swans Down measuring cup for my birthday last year. She found it at a yard sale for a quarter and thought I would like it. Like it? I LOVE IT and use it just about every time I bake. I collect vintage cookbooks and am going to have to go through them today to see if I have any of the Swans Down ones. If not, I know what to be on the lookout for! You sounds so much like me. 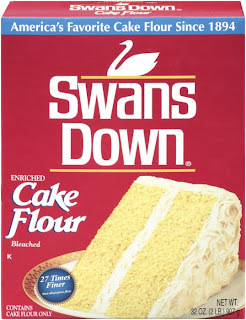 I use SwansDown because I collect SwanDown things. I don't have everything, of course. My measuring cup has larger letters than yours. I have the measuring spoons, pans and oven thermometer. Oh and lots of books. As for the ads, I leave them in my magazines but I do have one I bought framed. Buying SwansDown isn't easy here anymore. I have to have it special ordered or go to a tacky grocery store in a bad area of Wichita to buy it. At Christmas, Walmart had it. They bought so much that they had it marked down for 1.00, so I bought several and put them in a bag and froze them. I don't use it very fast. 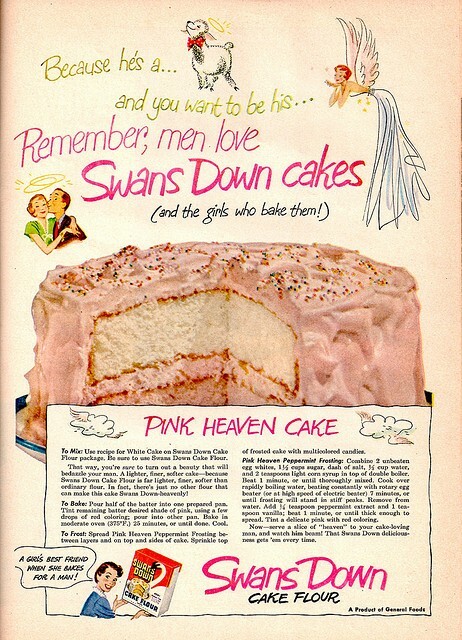 It is odd about the stores not carrying Swans Down. Gold Medal has a firm grip on my local area too. I can get my local Kroger's to order it. And when I need some... I go fill out the form, they will get some on the shelf for me to buy. Which is really nice. 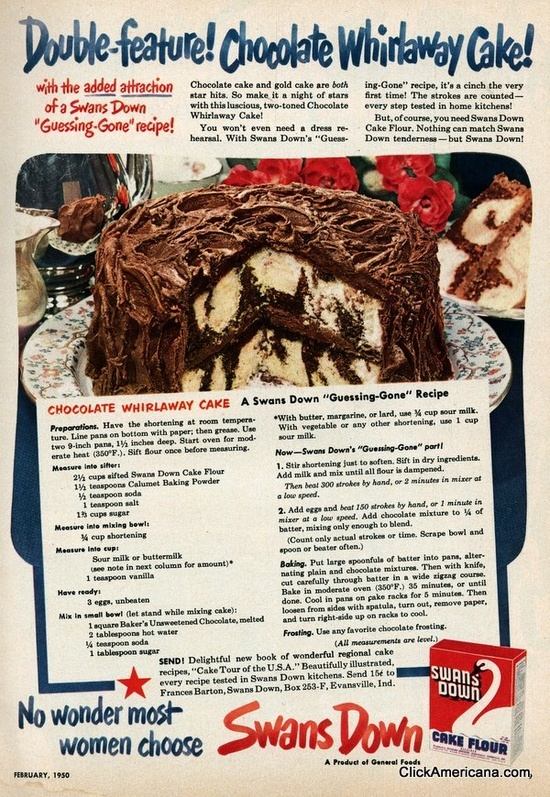 Their vintage cookbooks are pretty plentiful. The last one I came across was at the thrift store for .50 cents. But I always see them come Summer and the estate sales start back up. They tend to have gorgeous cover art on them. 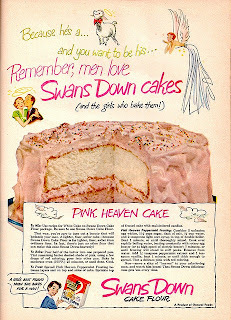 I just love your blog and all the pink!! Happy Easter! 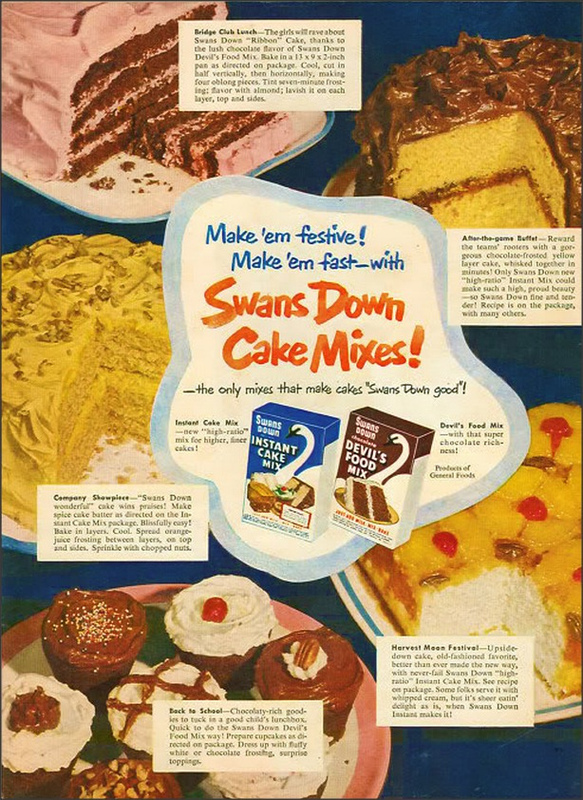 My Mom always used Swans Down for making my birthday cake! I'm wondering if it's even still available here in Canada. How's old is the took cup?